Upper Housatonic – The Hous is flowing a little over 200 c.f.s at the moment. That could change drastically today or tomorrow depending upon how much rain upper CT & MA will be getting with predicted thunderstorms. With higher temps & humidity also predicted, the water temperature will rise to levels that it’s best not to fish for trout. The good news is it’s prime ‘smally’ time on the river. In the early morning hours & at dusk, try using surface flies like gurglers and deer hair patterns. If you have to fish during high sun hours, use some gaudy & obnoxious streamers (I love using some with rubber legs), brightly colored deer hair patterns, as well as crayfish patterns (brown wooly buggers will work). This weekend I received reports that the small mouth fishing was excellent. If you do happen to hook a trout I recommend not taking it out of the water. You should be using a much heavier leader/tippet for bass, so horse those trout in a.s.a.p. Remember, it’s that time of the year that you must stay away from the thermal refuges. With water levels down it’s a great time to explore and investigate trout holes that you will be fishing in the fall. It’s also a great time to take kids and ‘newbees’ fly fishing with small mouth readily taking offerings. Don’t forget to pack up plenty of water on these warm & humid days. Farmington River – Perhaps more than any other time of year, right now there is the most insect activity on Farmy. Sulfurs, olives, caddis, terrestrials, and iso’s are all over the river. It’s a trout ‘all you can eat buffet’. One of my favorite bugs to look for is the isonychia. It’s a bigger fly and the fish love to gobble them, especially in the faster water. If I’m nymphing I usually go to smaller sized patterns at this time of year. You can’t beat small pheasant tail type patterns. If you have never fished a ‘perdigon nymph’, do so! It’s become one of my ‘go to’ patterns. Simple to tie and it gets down fast. If it rains today or tomorrow, the ‘next’ day I’ve found that between now and September, there is a good possibility of an ant hatch. In recent years, one of the flies I’ve started to fish on the Farmington are big oversized foam flies like the ‘Moodah Poodah’. Sometimes fish just can’t resist such a big meal. A high floating pattern like that is also great to use with a small nymph dropper. 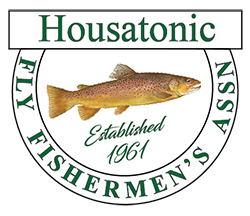 Lower Housatonic – Unfortunately the ‘doldrums of summer’ sums up how the lower Hous is fishing. You can still catch fish at the mouth but it’s a must that you fish between dusk to dawn. If you have a boat, travel a little outside the mouth to the rip on the Stratford side or the back side of Charles Island. Some boaters fishing chunks have done well in those two places. Sometimes the blue fish turn on this time of year, but nothing to report on that other than a few spotty hook ups.